The small market town of Helmsley lays about 10 miles West of Pickering on the A170. This road makes a peculiar Southerly route through the village after travelling West from Pickering. As you pass through the village the remains of the castle can just be made out over the roof tops. 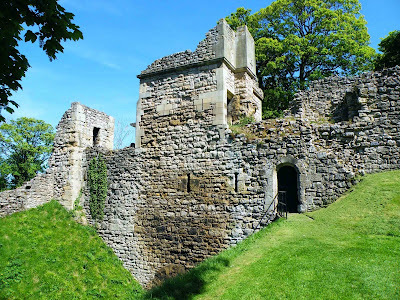 Built by Walter Espec in the early 1100’s, the castle is today represented by a wide range of surviving earthworks, masonry and upstanding walls and buildings. The most spectacular and recognisable of which has to be the half destroyed keep. Above. Looking South across the remains of the old gatehouse, into the courtyard. A good place to start when exploring these remains, are the remains of the Northern gatehouse and barbican. Today a wooden bridge spans the double ditch, taking you to the D shaped remains of the gatehouse….now standing to around two feet in height. This structure would have been protected on the outer earthen bank by a 13th century barbican…further protection for this, the original entry into the inner court of the castle. The gatehouse probably dates from the early 1200’s, as does most of the outer stonework of the castle, ie, curtain walls (excepting the Southern defences including the 14th and 16th century gatehouse here) The ditch here is around 30 feet deep, and is a similar depth for its complete circuit of the castle…well preserved and intact. Once over the modern bridge, the whole of the inner court is laid out before you. To the left, the keep can be seen (more about this faux keep later) the scrap of the 13th century chapel, numerous low footings of buildings, and to the right, the West range and the de Brus tower, along with the remains of the Hall and various towers. Above. Looking North East towards the ruined keep. The keep is a monumental structure, still standing to around 5 storeys tall. I say half, as only half of this towering building now stands on the edge of the moat. 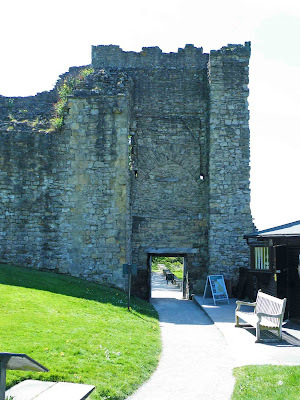 The outer walls of the ‘keep’ were destroyed along with most of the upper levels of the curtain walls on the orders of Oliver Cromwell’s government, after the castle was surrendered to Sir Thomas Fairfax in November 1644 after a three month siege. Above. Looking North across the courtyard towards the keep. This left only the inner shell of the building remaining. 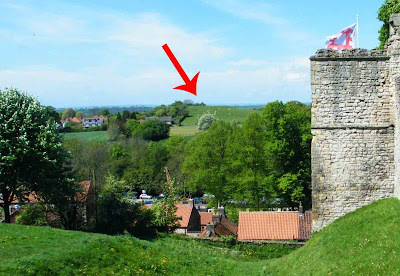 What is known, is that this building was in fact not the keep, but a tall chapel with an apsed (oval) projection out over the first defensive ditch. Above. Looking into the ruined shell of the keep. This chapel formed the core of the castle built in the early 1200’s, and can be entered from the inner court. Looking up at the now empty shell, its immense size can truly be appreciated. Above. Looking through the South Eastern, and more recent, gatehouse. Moving South from the ‘keep’ the Southern gatehouse still survives to a height of around 20 feet. 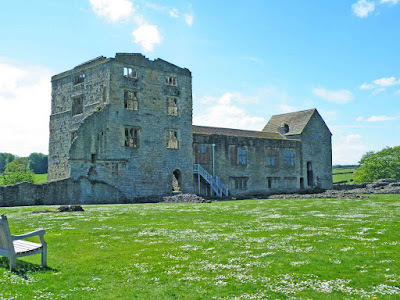 These immensely thick walls are part of the original castle from the early 1200’s, and lead onto the 14th and 16th century gatehouse that extends across the double ditches. Above. 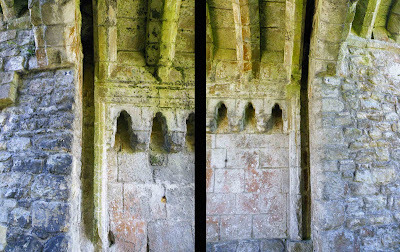 The portcullis grooves in the South Eastern gatehouse. 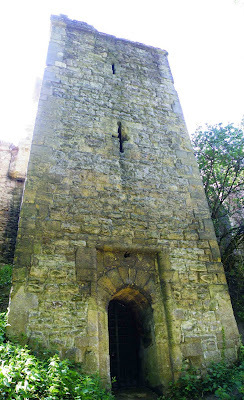 The outer gatehouse, or barbican, still retains its portcullis grooves, indications of the defences employed here. 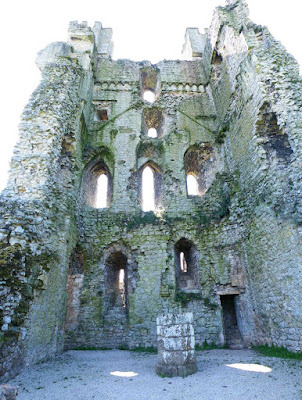 There are the intact remains of two D-shaped towers on either side, with standing portions of curtain wall, and then two more towers, one extending over the first ditch, and the other following the line of the curtain wall. Above. A view of the buildings on the South Western side of the castle. This latter tower would have provided defensive line of sight down the Western curtain wall, and out over the Southern portions of the outer court. 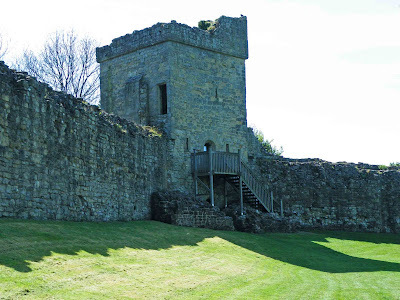 Here the rocky outcrop that the castle is built upon, can be seen beneath the curtain wall, indicating the strength of the site up on which the castle was built. Above. 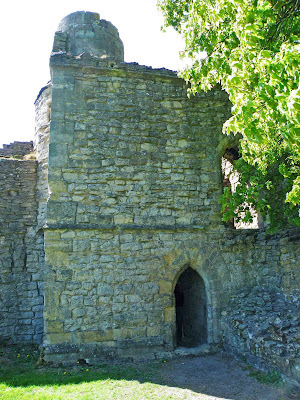 View of the faux keep from the South, showing the amount of damage done upon Cromwell's orders. Above. The original solar tower on the South West side of the castle. The building to the West of the inner court, consists of the castle’s original keep…the much altered early 1200’s solar tower. 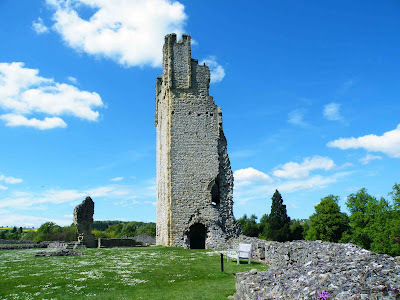 This tower was largely re-built on its Southern and Western walls during the early 1300’s. Whereas originally it would have been a stocky, probably almost windowless tower, sufficient as a last place refuge, it became, over the years, a lofty and comfortable tower, sporting a number of windows (including at ground level) suitable for accommodating important residents and guests alike. This tower lacks its roof, but is accessible. It sports an impressive pair of draw bar slots in the entrance wall, and clear indications of the comfort employed for those living in the castle. There are a multitude of fireplaces and indications that the tower had at least four floors. The whole of this castle will take you a good hour at the very least, to walk around...there are simply loads of remains here. I'll follow this up with a history at some point, which will give me the opportunity to add a few more photos. This interesting earthwork feature can be seen just to the North of the Castle Green Hotel in Kendal, sandwiched between the A684 and the Kendal to Windermere railway. The railway embankment lays some 50 yards to the East of the mound, with both structures appearing to merge gently into each other. 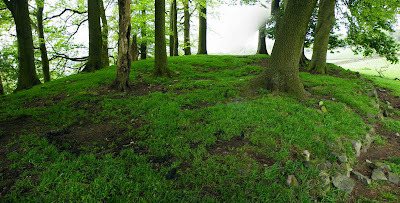 At first glance, this earthwork feature, a mound with a steep West facing slope, crowned by a huddle of trees, appears to be nothing special. Upon closer inspection however, a number of interesting points appear. 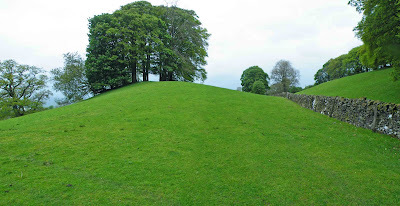 The mound is flat topped, with a ring of trees crowning the summit. There is a fairly large central area within this ring of trees. The rim of the mound appears to have been shored up...there are large amounts of masonry beneath the tree roots. For what purpose this building work was done, and from what period is not known. The fact that much of the masonry appears to be beneath the tree roots, could suggest that the stone work is older than many of the trees. The most complete piece of masonry, appears to be on the West facing slope, as shown in the photos below. This photo clearly shows the masonry beneath the root line of the mature trees. The stone work is visible most of the way around the summit of the mound, although on the North and Eastern sides, it is either buried just beneath the surface, or has been robbed or fallen away. The above photo shows the summit of the mound from the North. The slope here to the fields below, is much gentler. The photo below shows the mound from the South. The railway embankment can just be seen to the right of the photo. The walk to the summit from here is a gentle uphill walk. To the West of the mound, and at the foot of the steep drop, a shallow pond or mere can be seen. The original banks of this small mere can still be seen as earthworks higher up the field, indicating that it may have been larger some time in the past. It is this feature that I feel indicates the initial use of this site. If this earthwork feature is taken in the context of the Castle Green Hotel, which lays about 100 yards to the South, it could be suggested that it is merely a garden feature or 'prospect mound' attached to what was once a wealthy family's home, not a spoil heap from the nearby railway, and, unfortunately, probably not the remains of a motte and bailey castle!! 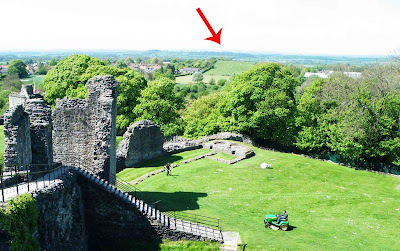 The Bindloss family built Castle Green as a home....and the motte, or the mound as it should probably be more correctly referred to as, which is probably one of the many drumlins left over from the last ice age, is ideally situated to give the family panoramic views over Kendal. 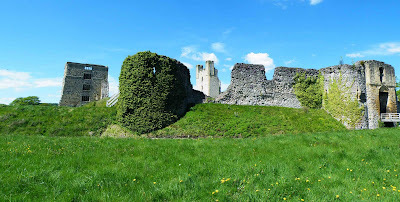 Indeed, the mound looks directly onto Kendal castle, some three quarters of a mile away to the West, with the tiny mere at its Western base making a pretty ornamental garden. The gentle slope rising from South of the gardens of the Castle Green hotel to the summit, would have made for an easy walk to the summit....and the masonry that encircles the summit could have been put in place to stabilise the earth and prevent any slippage, especially with the number of trees already growing there. There seems to be no evidence of this being a motte and bailey castle...there are no signs of infilled or silted ditches, no banks acting as defences at the base of the mound, and the fact that it's overlooked by higher ground to the East negates any defensive qualities this site might posses. All in all, this appears to be an interesting footnote to the Castle Green Hotel, built by a rich local family in order for them to enjoy the gardens of their home, and also to enable them to look out over the town that they lived and worked in.